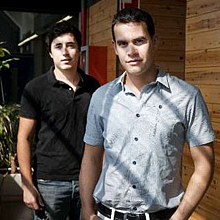 The company, established in 2008 by Horacio Martos and Andrés Bou, has become one of the most important in the videogame sector for social networks and mobile devices. It was recently selected as the first finalist for the sixth edition of the “Emprendedor XXI” Awards, for the category “Creces XXI”, the programme for entrepreneurs of “la Caixa”. The Emprendedor XXI programme highlights the high level on innovation and growth potential of the project Social Point, which today is one of the top 10 companies in this sector worldwide. The prize was in cash, a total of 4,000 Euros and the possibility to participate in the final phase of this award, with a grand prize of 100,000 Euros. Horacio Martos, one of the creators of Social Point, was one of the keynote speakers at the prize-giving of the international videogame contest Three Headed Monkey Awards that took place in the CaixaFòrum in Barcelona on the 14th May 2012.